Sign up for free and just shop with Interflora as normal. Our members earned £10,000+ at Interflora in the past month. Interflora cashback can be earned simply by clicking through to the merchant and shopping as normal. Interflora Cashback is available through TopCashback on genuine, tracked transactions completed immediately and wholly online. Send beautiful flowers to a loved one via a network of expert florists, whatever the season, and make savings when you order thanks to our Interflora discount code and cashback deals. The British flower experts ensure each of their exquisite floral gifts is of fantastic quality, while whether you are shopping for birthday flowers, anniversary flowers or surprise flowers, you will find a great range of choices for any occasion on the Interflora website. They are experts when it comes to floral design, having won gold medals at the RHS Chelsea Flower Show, while many of their florists have also won awards. Whatever you buy online, be it fresh-cut flowers or hand-tied bouquets, you can choose from a range of flower delivery options, including next day, same day and flowers within three hours. Register for a free account, meanwhile, and you can send flowers with a single click thanks to their Fast Flowers ordering service. You can browse a huge selection of floral gifts by flower type or brand, while they also sell food & drink and plant gifts, meaning you are sure to find something to make savings on with our Interflora promo code deals. Whether you are looking for lilies, roses or orchids, you can create your own bouquet and order personalised flowers, or choose from their selection of flower gift sets, flowers to wear, luxury flowers and presentation bouquets. Browse Julien Macdonald, Vera Wang and Fairtrade ranges, buy hampers, shop for Champagne or wine & spirits gifts or search for indoor and outdoor plant gifts such as a flowering planter. Fill in the form at the bottom of this page to become a member of TopCashback, if you are not already, and save today. Once you have made a purchase using our Interflora voucher code deals, order by 3pm and you can choose from one of their same day options. Options include Delivery today (between 8am and 6pm) or express delivery within three hours. Alternatively, you can arrange for flowers to be sent on a particular day in the future. There are four options with this service, standard (between 8am and 6pm), morning (8am-noon), afternoon (noon-6pm) and evening (6pm-9pm). If you live at selected London addresses, you can choose a two-hour delivery slot between 8am and 6pm, meaning they can be delivered at the most convenient time for you. They will also deliver flowers on a Sunday, between 9am and 2pm, or you can order online and choose to collect your gift from a local Interflora florist to give yourself. If you are ordering funeral flowers, they will be delivered for free at your chosen time of day to the funeral home or to loved ones. Floral and plant deliveries can be made by their courier partner for free, while you can choose standard delivery for food and drink items for £6. If you are sending flowers abroad, meanwhile, they will be sent to your chosen location for £10. Download the iPhone or Android app from Google Play or the App Store and use their mobile site to order flowers on the go. You can browse and buy from more than 70 flower bouquets and arrangements with confidence from the palm of your hand, wherever you are. They feature their weekly bestsellers on the home page, while their improved product pages feature more information and a tap to zoom function. They have a safe and secure transactional site so you can order with confidence, while they offer single tap calling for assistance or to place an order direct with their customer contact centre. Register for a free Interflora account and you will be able to take advantage of a great range of benefits. You will be able to track the status of your delivery and save favourite addresses, as well as ordering information like card details, so you do not have to enter them every time you shop, saving you time. Just provide a valid email address and password, and they will send you a confirmation email. You will then be able to access your account from anywhere, anytime, on your PC, mobile or tablet by logging in. With Fast Flowers, once you have registered for an account and set it up, you will be able to send flowers with just one click. When you click on the Fast Flowers link, they will show you three of their bestsellers. Choose the one you like and there will be no need for you to search the site. All of your account details will display in the relevant fields, meaning all you will need to do is check the recipient details, the delivery date and payment method, then click 'Place Order'. If you have a specific budget, you can click on the 'Shop by Budget' tab, choose an amount and one of their florists will create a stunning bouquet using fresh, seasonal flowers to that value. 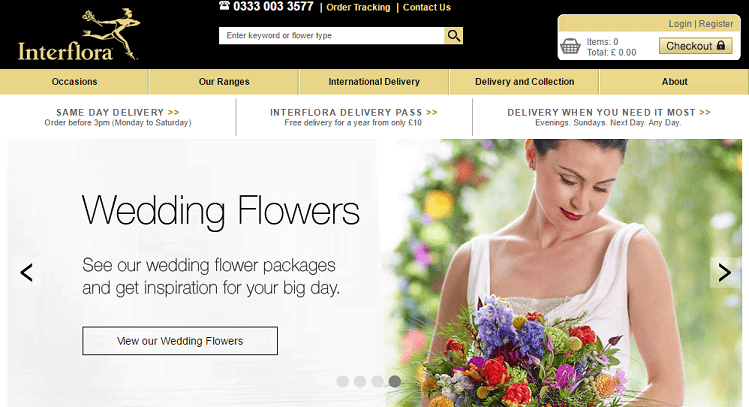 Interflora are the world’s largest and most experienced flower delivery network. They deliver flowers throughout the UK and Ireland via flower shops, while they also operate an international network in more than 140 countries. Each bouquet or arrangement is created by hand by one of their expert florists before being personally delivered with a handwritten message to the recipient’s door whenever you want, including evenings and Sundays. Do Interflora Deliver On A Sunday? Interflora can deliver beautiful flowers whenever you need them to, including on Sundays. When you order, you will find a range of delivery options, including Sunday delivery, which will see your flowers arrive between 9am and 2pm for a fee of £10. At Interflora you will be spoilt for choice if looking to send beautiful flowers. They ensure each of their exquisite floral gifts is of the best quality. They offer a great range of choices for every occasion, be it a birthday, anniversary or just to say thank you. They offer a range of delivery options, from three hour to same day and next day. Send beautiful, fresh-cut flowers and hand-tied bouquets, as well as a fresh selection of floral gifts, whatever the occasion or season.